In the city centre of Alicante, the 4 Star Melia Hotel is a wonderful place for a business and holiday traveler equally. Located right in downtown Alicante, the Melia Hotel is surrounded by the harbor side, the castle of Santa Barbara and a large sandy beach. So you have it all. As part of the Solmelia Group just like the Tryp Gran Sol Hotel, the Melia Hotel offers amongst a swimming pool, various wellness activities in its beauty and gym area. Its large business facilities are ideal for meetings and conferences. 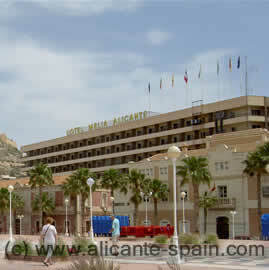 However, the biggest asset of this Alicante Hotel (you can get prices and availability here..) is its excellent location. 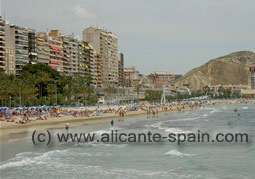 Proximity to all what Alicante has to offer and a breathtaking view to Alicante Castle and the harbor area. With more than 500 rooms the Melia Hotel Alicante is one of the larger hotels around the city. The beach (Playa del Postiguet) is just next, so it is ideal for summer and swimming, but also for nice beach walks during off season. The Melia – Perfect Location, a very nice Alicante Hotel.